Elevators are an Essential part of Oral Surgical procedures as they are used in multiple purposes like reflection of mucoperiosteum or gingiva, mobilizing teeth, removal of teeth and removal of roots. In most cases they are used to loosen firm teeth before application of forceps to extract the tooth out of the socket. An Elevator is a simple instrument which consists of three parts – handle, shank and a blade which is the working end of the instrument. Types of teeth which are removed by Elevators: Impacted, Malposed or tooth which are impinging on the adjacent tooth, Grossly Decayed tooth without sound crown structure and tilted teeth. Types o Roots which are removed by Elevators: Roots fractured at Gingival line, apical third, fractured at middle of the root, Root Stumps in the alveolus. Adjacent tooth should not be used as a fulcrum as it results in luxation of the tooth as well. It should only be used when it is to be extracted. Always used the interdental bone as the fulcrum or your finger. The Concave or Flat surface of the blade of the elevator should be facing the tooth or root which is to be extracted. 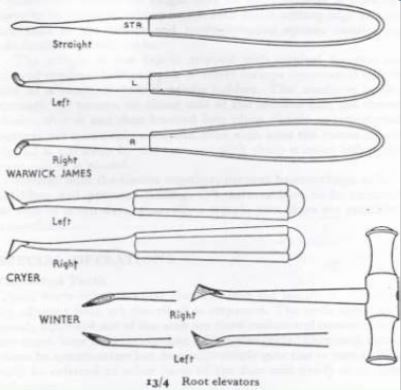 This is the most commonly used principle or technique used with Dental elevators. 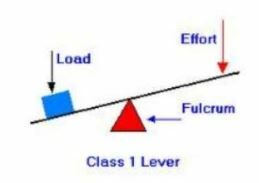 The Lever principle comes with three basic components – Fulcrum, Effort and Load. Elevator is the lever of first order or Class I lever. Fulcrum is positioned between the Effort and Resistance. When the force is applied at the long effort arm, the mechanical force is multiplied and exerted on the short load arm – positioned on the tooth. Where is Lever Principle used – When used with Forceps, it is used in a combination of wheel and axle as it is not much useful when used on its own. When used with forceps, the hinge of the forceps acts as the fulcrum while the arms of the forceps act as each component of a lever. To exert the most force, the grip should be farther from the fulcrum or hinge. When used with Elevators, the handle of the elevator is the Effort while the tip of the blade is the working end applies the load to the tooth where it is engaged in. A Wedge basically expands, splits and displaces the object that receives the force. A wedge consists of two movable inclined planes with a base on one end and a blade on the other end which overcomes a large resistance at right angles to the applied force. The Wedge (Elevator) is forced or pushed into the space between the root and the bone parallel to the long axis of the root. The force is applied on the base of the plane which turns this resistance into force on the slant side. Where is Wedge Principle used? It is used in Elevating the tooth or root out of the socket. It is used along with the lever principle where the wedge force splits, expands and displaces the tooth from the socket while the lever principle is used to remove it from the socket completely. Wedge principle is used by positioning a straight elevator tip between the tooth and the alveolar bone and applying slow and constant apical pressure to tear the periodontal ligament attachment from the bone and luxating the root or tooth. 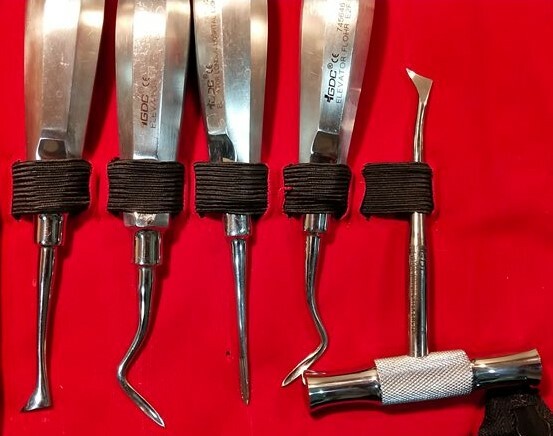 It can also be used with forceps, where the beaks are exerted into the PDL space between the root / tooth and the alveolar bone and pushed apically, this expands the bony socket leading to separation of the PDL ligament from the bone leading to luxation of the tooth. It is the most aggressive of the three principles, the force is applied to the circumference of the wheel which turns the axle to raise the weight or the tooth. The main use of Wheel and Axle principle is done by Crossbar Elevators which engage into the space between the root and the bone, the handle is at right angle to the shank which is rotated . If applied in an improper manner, it will lead to fracture of mandible as the amount of force applied is more due to the right angle positioning of the handle to the shank. Periosteal Elevator: Used before the start of Extraction is reflection of the mucoperiosteum from the underlying bone, this helps is clearing the working area from the gingival covering. Apexo Elevators: These are used to remove fractures root pieces from the alveolar bone or impacted third molars and also Impacted Canines. Due to their narrow working ends, these can be inserted into the narrow spaces between the root and bone to luxate the tooth or root. The Apexo Elevators are divided into three types depending on their usage – No. 301 straight apexo elevators which are used to remove fractured roots of maxillary central and lateral incisors, premolars and canine. No. 73 and 74 are used for removing impacted maxillary molars thanks to their shank curvature. No. 4 (302) and 5 (303) apexo elevators are used to remove root tips which are broken below the gingival line, this is possible as the blade is at a 90 degree angle to the handle. Crossbars (Winter’s crossbar elevator): These are used in removal of mandibular molar roots and impacted mandibular third molars. They are available in three types based on use – No. 11L and 11R used to remove right lower third molar. No. 14L and 14R used to remove mesial roots of tight lower molars and distal roots of lower left molars. No. 1L and 1R are used to remove vertically impacted third molars and also for luxating maxillary and mandibular teeth.